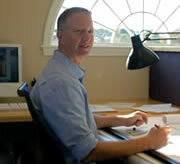 TSBeard Architecture is a small firm specializing in complete design services for custom residential projects. The practice was founded in 1998 by Thomas Beard, following twelve years of experience with two of Boston’s most prominent architectural firms. Our projects, which include new houses, additions and renovations, are located throughout New England. TSBeard Architecture emphasizes handcrafted design, combining the particular needs of each client with the natural and cultural context of their site. We strive to synthesize forms and materials indigenous to the region, with a modern attitude toward contemporary lifestyles and construction technology. We are conscious of our architectural and environmental impact on the land, and endeavor to create structures that are both appropriate and distinctive, and that are efficient in their use of energy and resources. Our process involves a close collaboration with the client throughout the project, from preliminary evaluation of the site or existing conditions, through detailing of the interior spaces. In addition, we work closely with the builder during construction to ensure that our visions are realized. The cooperative nature of this process results in a well-crafted project that specifically addresses the needs of the client.